Whether it’s you’re rooting for your alma-mater or your favorite team, college football season is an amazing time to spend with friends and partake in the sport’s most essential pre-game activity, tailgating! Your Clermont Toyota vehicle is key to having a successful tailgating celebration. Think about it! Your car isn’t just your transportation to and from the game, it’s your hang out spot, kitchen, and play area all in one. 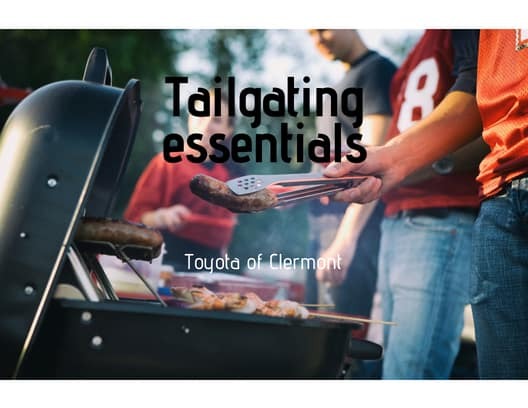 Making sure you have all the necessary supplies will guarantee you an epic tailgating celebration and that’s why Toyota of Clermont is here with an easy guide! While this first tip isn’t an end all be all for your tailgating experience, but you have to take into account the Clermont Toyota vehicle you’ll be using to host the celebration. At Toyota of Clermont, we recommend using a larger vehicle like a Toyota 4Runner SUV or a Toyota Tacoma to ensure that you have ample space for people and supplies and the necessary utility to pull off a successful tailgating celebration. Bluetooth speaker(s): Setting the mood, bringing friends together, and enhancing your tailgating experience are all accomplished with the right music. Bluetooth speakers are great to use so you always have access to your phone and can control the tunes without getting distracted from the fun! Portable grill: A proper tailgating experience typically involves food and plenty of it. Having a portable grill on hand in the back of your Clermont Toyota truck or SUV will keep everyone fed and having a good time. Cooler: If you’re going to have food, you’ll also need drinks. Make sure to keep things chilled and bring a cooler with plenty of ice. Lawn chairs or portable seating: While the back of your Clermont Toyota SUV or truck may provide ample seating for all your guests, it’s always best to bring alternative seating if you have more people than expected. Hot food cooler: It sounds weird, we know, but storing your hot food and keeping it hot is essential for a successful tailgate. Use hot bricks and aluminum foil to line the inside of a cooler to keep your food offerings warm throughout the festivities. Jumper cables: While they’re most definitely essential for an emergency kit for your Clermont Toyota vehicle, jumper cables will come in handy if your car’s battery loses too much charge throughout the tailgate. Keeping the car running or wiring accessories to the battery will cause it to drain quickly and could leave you in hot water if you’re not careful. Be sure to have a set of jumper cables on hand if your Clermont Toyota vehicle breaks down. With college football season here, you need to make sure you’re ready to host the most epic of tailgates! Make sure you have the right vehicle or that your current vehicle is ready to celebrate. Come visit us at Toyota of Clermont! We have all your accessory, auto maintenance, and new vehicle needs all under one roof. Stop by 16851 State Road 50, just off the Florida Turnpike, seven days a week!